Mark Hamill, who played The Trickster in CBS' live-action The Flash series, is revisiting the character after 14 years. Hamill is the voice of The Trickster in the upcoming "Flash and Substance" episode of Cartoon Network's Justice League Unlimited. Hamill played The Trickster in two episodes of the short-lived The Flash: "The Trickster," which premiered on Feb. 7, 1991; and "The Trial of The Trickster," the series finale which aired on May 18, 1991. Both episodes were written by John Francis Moore and Howard Chaykin. Hamill, of course, has a long history with Warner Bros. Animation, voicing The Joker. "When I look back on it now, some of the most interesting and challenging parts I've played have been in animation," Hamill told The Continuum in an interview just before Batman Beyond: Return of the Joker came out. "None of the villains I play think of themselves as villains. Even the Joker is this genius who is frustrated by the fact that no one recognizes his great genius." The "Flash and Substance" episode of JLU, which also features Batman, Orion and Flash's Rogues Gallery, has yet to be scheduled by Cartoon Network. Look for more Justice League news on Wednesday here in The Continuum. Stan Lee has been filmed in a cameo for the third X-Men movie, 20th Century Fox has confirmed for The Continuum. The Continuum has also learned that another famous X-Men writer filmed a cameo on the same day. The studio hasn't confirmed it, but it is believed to be Chris Claremont. Lee has appeared in previous Marvel films X-Men, Spider-Man, Spider-Man 2, Hulk, Daredevil and Fantastic Four. * Marvel Comics will be publishing an adaptation of the movie. In addition, a trade paperback will be published, collecting the adaptation as well as reprints of stories that tie into the movie's characters. The trade paperback is tentatively scheduled for April 1. * Harper Collins will be publishing youth books tied into the film, including a junior novelization and a movie storybook. * Look for more on the film soon here in The Continuum. DC Comics has released the cover to The Batman Strikes! #15, which ties into the Oct. 18 release of The Batman vs. Dracula on DVD. The cover is by Jeff Matsuda, who is a producer on the film. The issue features a story called "The Lost Ones," written by Matthew K. Manning with art by Wes Craig. The story, which guest-stars the Penguin, serves as a companion piece to Batman vs. Dracula, and introduces Dracula into Gotham City. The issue is scheduled to be in stores on Nov. 9. Click on the thumbnail for a larger image. For covers and five-page previews of DC Comics titles scheduled to arrive in stores on Oct. 5, CLICK HERE. Albion #3, Batman: Gotham County Line #1, Outsiders #29, Robotech: Prelude to the Shadow Chronicles #1 and Swamp Thing #20. Aspen Comics has released its solicitation information for December. For a rundown, with promotional images, CLICK HERE. For covers and five-page previews of Image Comics titles scheduled to arrive in stores on Wednesday, CLICK HERE. Titles include Spawn #149, Invincible #26 and The Gift #13. Pete Woods, artist on Catwoman and Detective Comics, has signed a three-year exclusive agreement with DC Comics. "I couldn't be happier," Woods said. "DC has been a great company to work for, and these are really exciting times. The past year on Catwoman has been a fantastic experience for me, and the fan response has been phenomenal. "Both (Senior Editor) Matt Idelson and (VP - Executive Editor) Dan DiDio gave me the space I needed to come up with something just a little bit different. The next year holds a lot of surprises and I'm eager to get started!" Idelson said, "Pete's work has grown by ridiculous leaps and bounds since we first started working together eons ago, and to see the heights he's reaching on Catwoman... well, it's a joy being his editor and telling him what to do!" 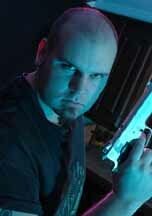 * Artist Matt Busch has signed a deal with Razor Digital Entertainment to release his first independent movie, Conjure, on DVD. In addition to writing, producing, and directing the feature, Busch also plays himself along with fellow artist/model Sarah Wilkinson in a supernatural thriller. Click on the thumbnails for larger images of Busch and Wilkinson. * Marvel Comics is reporting that House of M #4 -- by Brian Michael Bendis and Olivier Coipel -- has sold and it is going back to press for a second printing with a new full-color variant cover by Gene Ha. It will reach stores on Oct. 19. Bendis said that House of M #7 has been completed. "[Editor] Tom Brevoort and I just put issue 7 to bed and it's near perfect Coipel," Bendis said. "You ain't seen nothing yet. Remember when we said the Marvel Universe would change at the end. I saw it drawn and lettered. It's done. It happened!" * Coming Wednesday: Animation news, Marvel news -- and much more!!! * Saturday, Sept. 17: Dark Horse First Looks and Justice League Unlimited. * Friday, Sept. 16: The Batman, Lost executive producer writes for Marvel and Dark Horse First Looks. * Thursday, Sept. 15: New Thunderbolts vs. New Avengers, The Losers movie and First Looks. * Wednesday, Sept. 14: Marvel and BlueWater First Looks and The Batman. * Tuesday, Sept. 13: Supergirl #1 third printing, new Teen Titans episodes, Top Cow's V.I.C.E. and DC Comics First Looks. * Monday, Sept. 12: Underworld: Evolution, DC second printings and Ultimate Avengers. * Saturday, Sept. 10: Sin City deluxe DVD, Heroic Publishing's Tigress and Dark Horse's Perhapanauts. * Friday, Sept. 9: IDW solicitations for December and The Batman. * Thursday, Sept. 8: Dark Horse solicitations for December, Fantastic Four DVD, Ultimate Spider-Man video game and The Batman. * Wednesday, Sept. 7: Frank Miller covers All Star Batman, Ghost Rider movie and Marvel, DC and Image First Looks. * Tuesday, Sept. 6: Ghost Rider movie date, Marvel's deal with Paramount, Amazing Screw-On Head animation, Giant-Size X-Men #4 and Mitchell Breitweiser exclusive with Marvel. * Monday, Sept. 5: X3 and Superman Returns.